Today, I have Femme Fatale’s exclusive givings for April. The Color Of The Month and Fiend Of The Month shades are created based on images suggested by a member of the Facebook Group. I’m coming in right at the nick of time with this one so if you’re loving these, rush to get them. Let’s take a look at the Femme Fatale April COTM and FOTM! 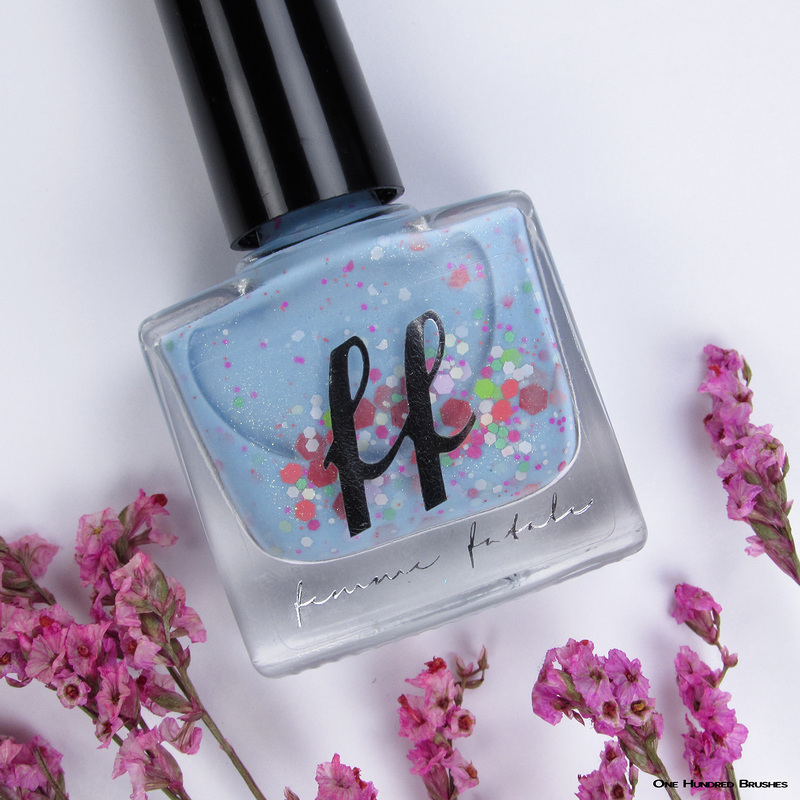 If you’d like to be a part of inspiring the monthly colors from Femme Fatale, be sure to join their Facebook Group. Also, to purchase the Fiend of the Month shade, you would need to be part of the group. Don’t worry, it’s (monetarily and hassle) free! Now, doesn’t Fugenzo just scream Spring!? Fugenzo was inspired by an image of pink blossoms with a bright sky in the background. The shade captures this image effortlessly which is something I always find delight in. 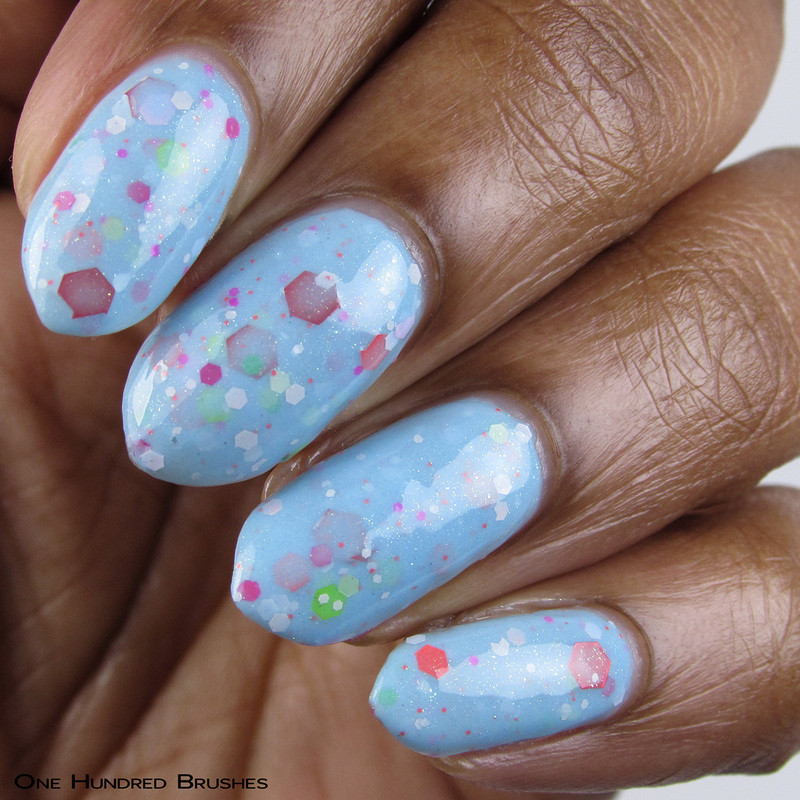 Fugenzo is a pale sky blue crelly with a mix of hot and pale pink, white, lime and green assorted sized glitters. The base is accented with soft lime glass flecks that add a nice, shimmery look at especially at angles. Thankfully, I did not have to cox any of the glitters; they apply willingly and lay nicely due to the workability of the creamy base. 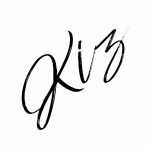 Be aware that these glitters leave behind more bumpiness than roughness, however this is eased with a generous topcoat. I’m wearing three coats with a glossy topcoat. Next up, Inflorescence, the Fiend Of The Month, inspired by an image of lush, multicolored bougainvillea flowers. 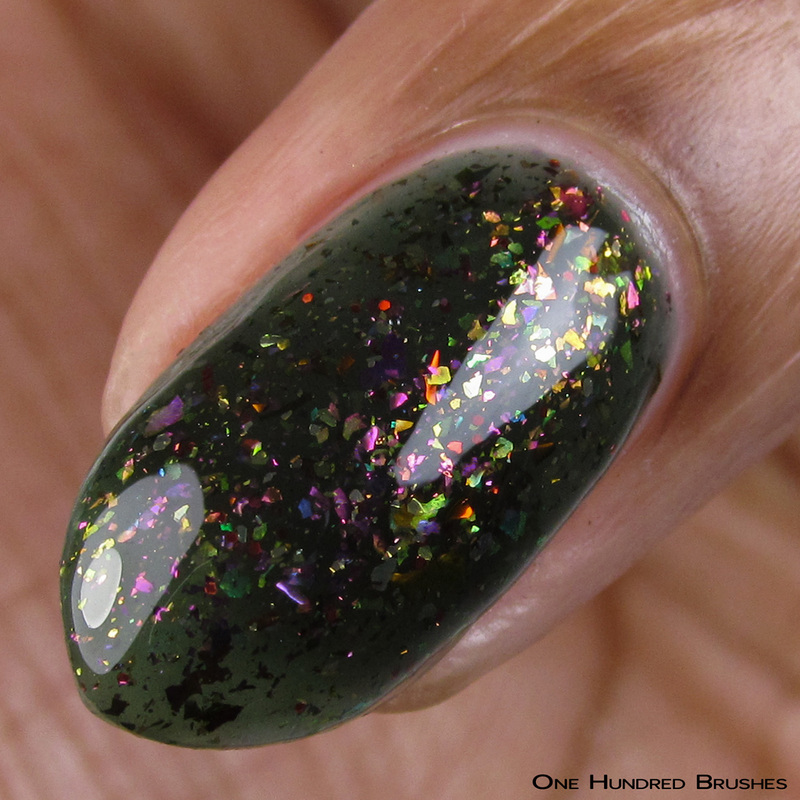 The base here is a dark moss green jelly with a mix of iridescent, chrome and metallic shreds. It’s incredibly colorful and bold; a nice contrast due to the darker base. 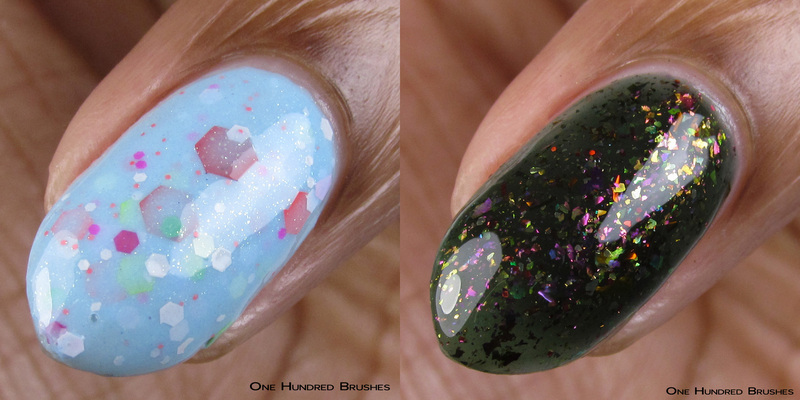 The flakes apply with ease and they mimic a floating effect because of that green jelly. Here, I’m wearing three coats with a glossy topcoat. 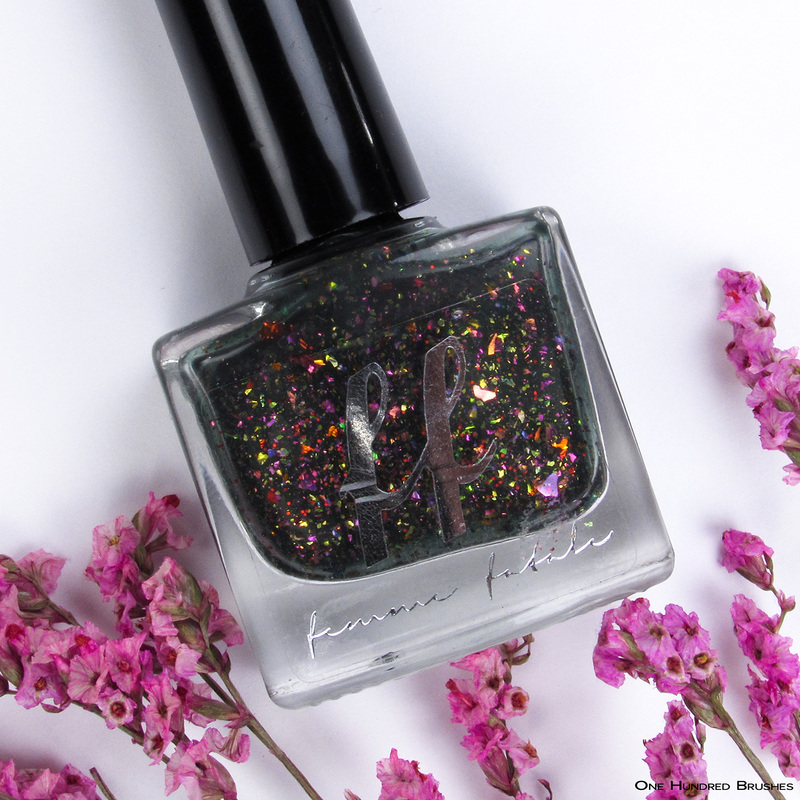 Remember, you need to be part of the Femme Fatale Facebook Group in order to purchase this shade. The COTM and FOTM for April are now available for purchase from Femme Fatale.